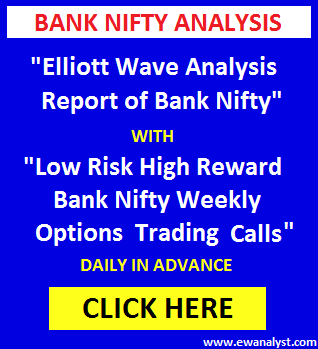 Bank Nifty bounced sharply on Tuesday to register new life time high 21947 but failed to sustained at higher levels and declined back lost whole bounce same day. 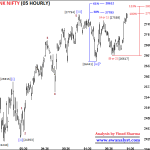 Low of Nifty was 21636 and 21671. 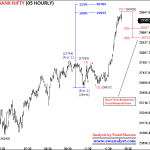 I expected a bounce towards 22043-22442 in Bank Nifty in coming days and favoured longs with stoploss. 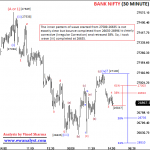 Bank Nifty bounced but after triggering the stoploss given in last report. 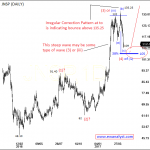 Overall pattern is still suggesting bounce towards 22043-22442 but interenal pattern had changed. Now, we need to look at fresh chart for further outlook and trading strategy. 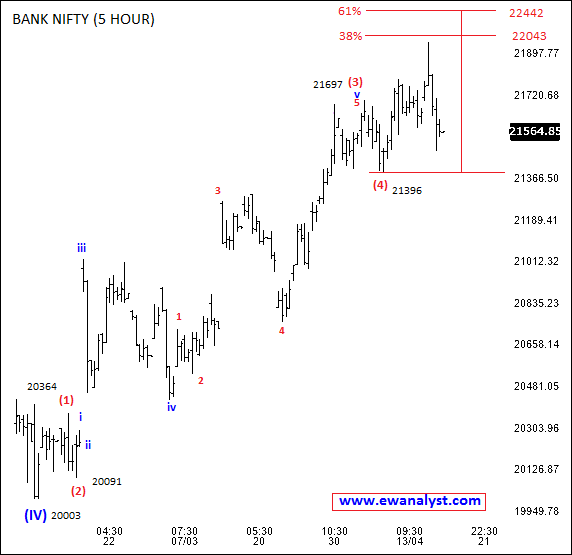 This is 5 hourly chart of Bank Nifty showing bounce from 20003 which is start of wave (V) on previous chart. 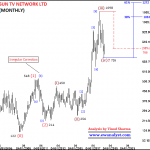 There is no change in wave counts on this chart. May be wave inner wave (3) of (v) is already completed at all time high 21696 and wave (4) may be already completed at 21396 and (5) may be started from 21396. Inner waves of wave (3) [from 20091-21696) are bit complex and inner wave V of (3) is highly extended more than 123% but counts are following all the rules. 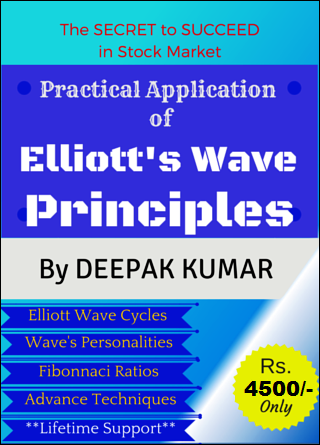 If wave (4) is completed at 21396 then minimum 38%-61% projection for wave (5) is at 22043-22442 so, 22043-22442 is the minimum target range if we are right at counting the waves. 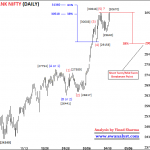 Bank nifty achieved 21787 till now. Now, we need to analyze the progress of wave (5) started from 21396 on separate 15 Min chart. This is 15 Min chart of Bank Nifty showing bounce from 10 Apr 2107 low 21396 which is the start of wave (5) on previous chart. May be an impulse is completed from 21396-21786 we can consider as (A or 1). But there is Irregular Correction pattern after that impulse. 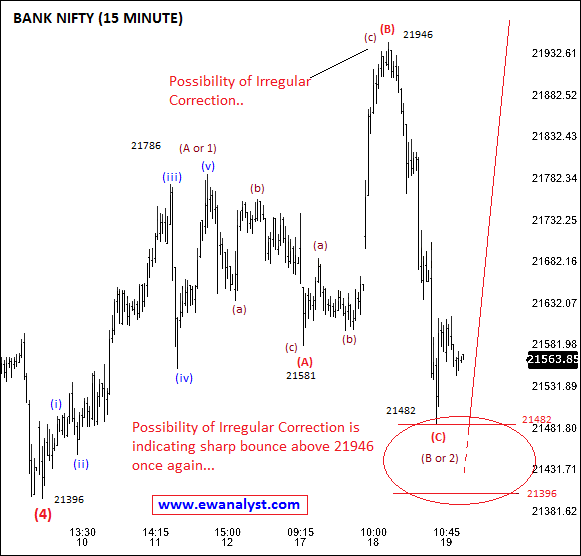 Wave (A) of Irregular Correction is from 21786-21581, (B) from 21581-21946 and (C) started from 21946. 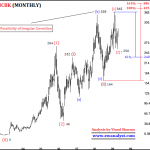 No matter what is previous pattern, but this Irregular Correction pattern is indicating a sharp bounce above 21946 very soon and may be from 21482-21396. Overall pattern on 5 hourly is indicating a minimum bounce towards 22041-22442 and Irregular Correction on 15 minute chart is indicating a bounce above 21946 very soon. 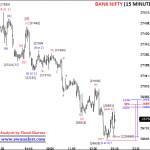 The bounce may be from 21482-21396 range or from bit lower levels. For Trading, short term trading strategy must be focused on Buying side keeping upside Bank Nifty targets of 21946-22043 in mind. Buying must be planned strategically on decline till 21396 with stoploss some points below 21396.